To the list of lofty names that glamorize the city’s fried chicken stands, like Crown, Royal and Kennedy, one Brooklyn restaurant owner decided to add another: Obama. From the restaurant’s perspective, the name change grew out of pride in the new president and a keen sense of commerce. From other perspectives, it was tone-deaf at best, and racist at worst. When the restaurant, Royal Fried Chicken on Rutland Road in Brownsville, changed its name last week to Obama Fried Chicken, the reaction was swift. It was the latest outbreak of commercial enthusiasm for President Obama and his family. An Illinois company tried to sell dolls that looked like the president’s daughters, and a Brooklyn brewery, Sixpoint Craft Ales, named a beer Hop Obama in honor of the community organizer in chief. A few minutes’ drive from Obama Fried Chicken, Obama Beauty Supply opened its doors several months ago. Its owner, Mohammed Seraji, said he was inspired by his children’s enthusiasm for the president, along with Mr. Obama’s popularity in the neighborhood. A Michelle Obama wig he sells, for $49.99, is emerging as a popular item. At the restaurant, Mr. Jabbar, who said he had been a lawyer and university instructor in his native Bangladesh before moving here in January, has, apart from serving food, become Obama Fried Chicken’s spokesman. The owner, he said, did not wish to speak to reporters. Explaining the decision to rename the restaurant, Mr. Jabbar said that not only was the owner fond of President Obama but that the entire neighborhood also “loved” him. “From this love, everything is happening,” Mr. Jabbar said, weary from all the attention. 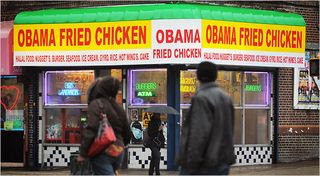 There were support and derision for the unnamed owner along Rutland Road, where most every store hangs a picture of the president, and where, on a rainy Friday, passers-by took cellphone pictures of the rebranded fried chicken stand. “Did he get permission from Obama?” Mr. Benoit asked. Competition might have played some role in the new name. Crown Fried Chicken is across the street, owned by Osman Mohibi, 47, an Afghan immigrant. He keeps pictures of Mr. Obama and Vice President Joseph R. Biden Jr. taped to the plexiglass divider by the cash register. The owner told him it would be taken down the next day, Mr. McCall said. When it was not, he contacted the owner again. “I said we would be out there having a rally,” Mr. McCall said. At the store on Friday afternoon, Mr. Jabbar served ice cream to teenagers and chicken wings to regulars. He said he did not really understand the pressure to bring down the sign, since everyone who came in the store seemed to like the idea. And he was concerned about what would happen if the community advocates returned.